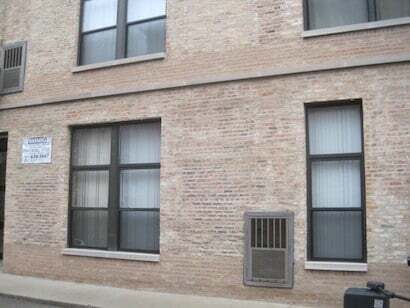 A well-respected property management company turned to AAA-1 Masonry & Tuckpointing to find the source of chronic water damage at one of its turn-of-the-century lofted condominium buildings in Chicago. 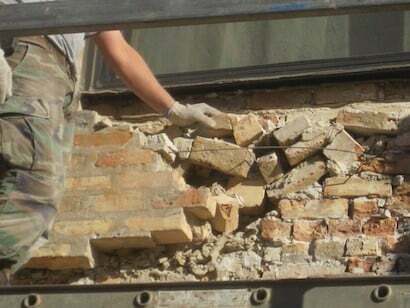 Initially, the culprit appeared to be severely damaged bricks and mortar stemming from a destructive sand-blasting job performed by the developer during condo conversion. An up-close inspection revealed hastily repaired mortar joints and poor quality brick replacement in the work area. Due to the rapid approach of winter and the Association's budget constraints, AAA-1 Masonry & Tuckpointing installed a heavy-duty vinyl tarp and stainless steel fasteners to protect the area until the spring. When work commenced the following year, we were surprised to see just how poorly the developer had "rebuilt" the wall (see photo). No wonder the wall had a history of water infiltration! After only one day of work, the defective masonry, including the brick windowsills, had been dismantled and rebuilt back to their original sound and plumb condition. Since the completion of the restoration work in 2009, there have been no reports of water in the work area.